Railroad accidents are not a rare event act quickly to protect your rights. 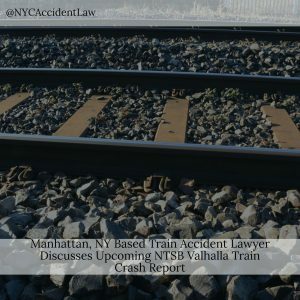 As reported by CBS New York, the National Transportation Safety Bureau (NTSB) is set to release the results of its investigation of a deadly train accident that took place two years ago in Valhalla, New York. The crash, which occurred on February 3, 2015 in the evening hours, involved a commuter train on Metro-North Railroad’s Harlem Line. The train struck a vehicle, killing the car’s driver and six people in the train. Fifteen other people were seriously injured in the crash. The CBS report states that her SUV “became caught in heavy traffic on the railroad crossing…” According to the husband of the female motorist killed in the crash, the crossing was dangerous. According to the story, the light is controlled by the State Department of Transportation on the Taconic Parkway and should have turned green to ensure the area surrounding the railroad crossing was free of traffic. The report also states that the NTSB has said the light did not turn green at the time of the accident, causing traffic to back up from the intersection to the crossing. The news report goes on to state that the crossing remains essentially unchanged from the night of the crash, save for the addition of a sign. Railroad disasters are in fact common enough that a recent CBS News report lists 11 major catastrophic train accidents in recent history, with the accidents occurring between 1993 and 2015. In several of the crashes, hundreds of passengers were injured. If you have been involved in a train accident or train derailment, it’s important to speak to an experienced New York City train accident and mass transit accident lawyer as soon as possible. Act quickly to protect your rights. Manhattan NY Based Train Accident Lawyer Jonathan C. Reiter.